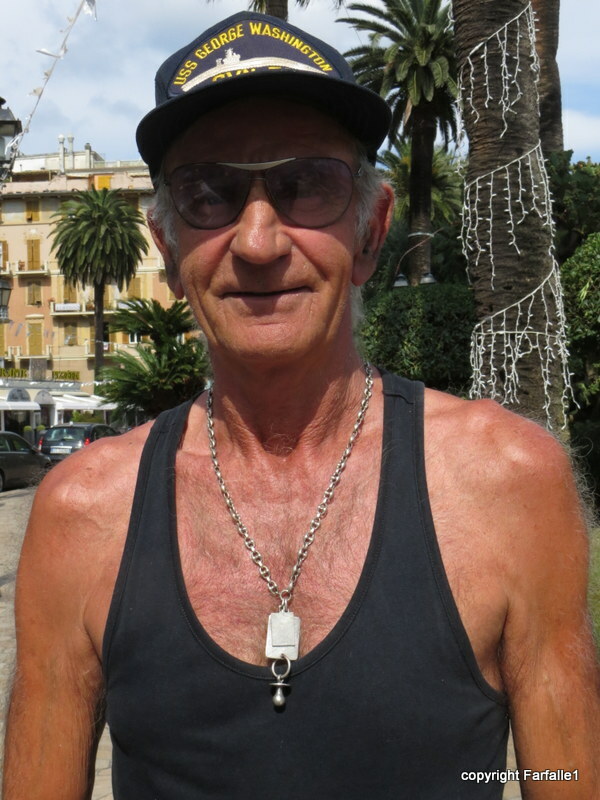 Meet Franco Tassara, Master Shipbuilder, of Cogorno (a small town on the far side of the Valle Fontanabuona, on the other side of the mountain from Rapallo). Studying his photo there are two things I wish I noticed when we were chatting, and that I asked him about them. First, the hat? How did he come to have it and why? Second, why does he wear a small metal pacifier on his necklace, or is that something else, perhaps a microphone? He clearly has a sense of humor as his calling card gives him the honorific Conte Decaduto (Count Decrepit). In any event, calling Sig. Tassara a Shipbuilder is an exaggeration, if only of scale. He does not build the ships that sail the ocean blue, rather he builds quite lovely model ships, some of which he is willing to sell and which he displays, idiosyncratically, on the roof of his auto. This whimsical display caught Speedy’s eye as we motored through town a while ago, and we came back to investigate. That is when we met Sig. Tassara and chatted with him about his models. He was most eager that I pose holding them. Perhaps he thought that, like puppies, once you’ve held one you simply can’t live without it. Alas for him, it didn’t work in our case, but we did enjoy getting a close-up look at his meticulous work. He makes models of all different kinds of boats. Foolishly I forgot to ask what the names of the boats are. Fortunately our friend T. is a nautical wizard, Dinghy Class champion, meticulous sailing judge and general mistress of the wind and seas. 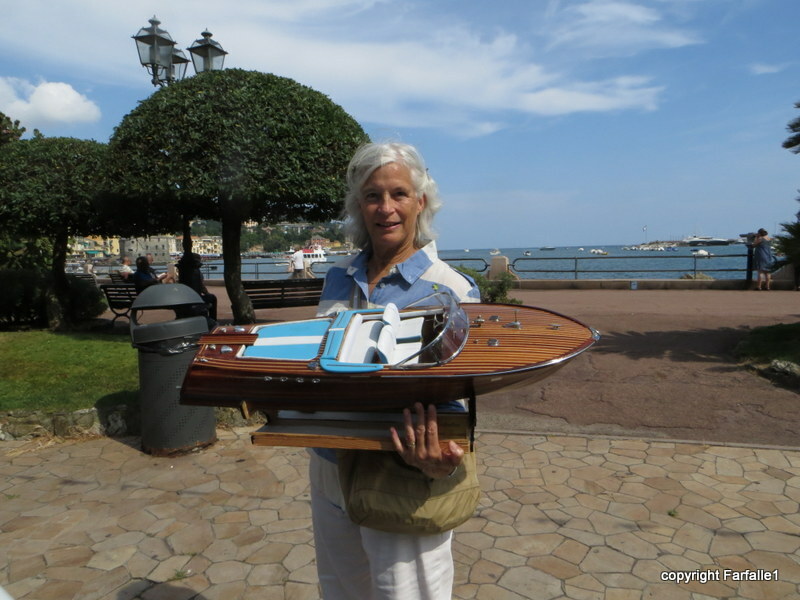 She told me the ship below is called a Runabout, and may be a model of the Riva Aquarama, a famous luxury wooden Runabout made by the shipbuilders Riva. Photo from Daniele Martino’s Flickr Photostream. Thank you Daniele. Sig. Tassara was a tug-boat captain, so the sea is honestly in his veins. He has made models since retiring and spends many an hour at it. 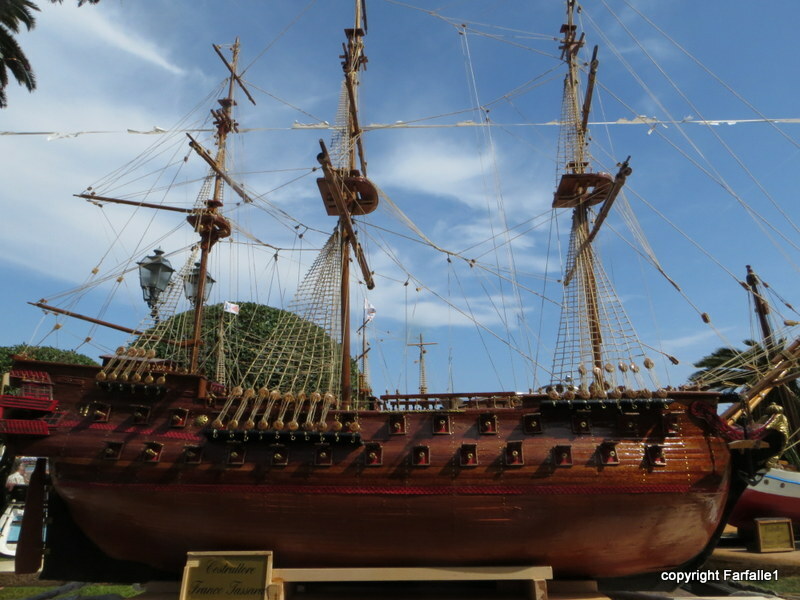 A ship like the Galeon may take him three or four months to complete. 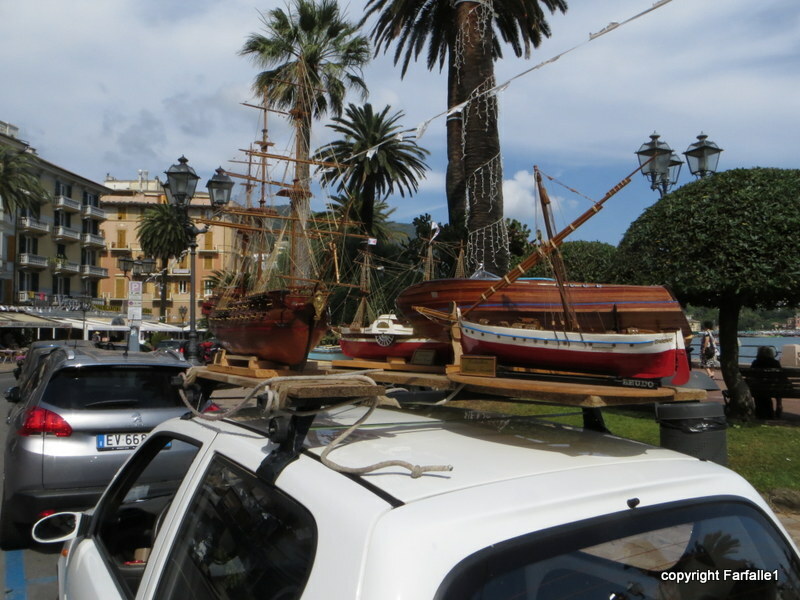 One like the Runabout may take only three or four weeks. Sig. Tassara, along with others with the same hobby, exhibits his boats at the Mare Nostrum show which is held annually in November in the Rapallo Castello (you can read about an earlier iteration of the show here). Living up on the hill as we do we sometimes forget how very central the sea is and has always been to life in Rapallo. This annual exhibition is an always fascinating glimpse of the many facets of the ongoing relationship between the two. The dates for the 2014 show have not been posted on the Mare Nostrum website yet, but it is most always held in the latter half of November. If you find yourself in Rapallo then, do pay a visit to the show and seek out Sig. Franco Tassara, who will probably be happy to let you hold one of his puppies.